The self-purification capacity of the atmosphere (SCA) over the continental part of the Asian mainland is largely determined by a combination of the interaction of its general circulation with the underlying surface. Because of the influence of regional characteristics of orographic systems, such as an alternation of dissected depressions, large mountain ridges and narrow valleys, this area is characterized by the formation of seasonal local baric centers. In winters, these are the fields of increased pressure in valleys and intermontane depressions, united into the Asian anticyclone centered over the north of Mongolia, whereas regions of closed thermal depressions are typical of summers. In water-filled depressions (such as the Baikal hollow), because of the influence of the water masses, the local field of increased and decreased pressure is observed in summer and winter, respectively. The strength of local baric centers determines the processes of energy and mass exchange with neighboring territories. Under anticyclone conditions, a standard decrease in air temperature with height (vertical gradient 0.65 °C/100 m) is distorted, and its rise is observed. The mean thickness of sustained winter inversions approximates the anticyclone height, and its largest maximum intensity in January over the even lands (4-5 °C) and over the mountain depressions significantly differ [Sevastyanov, 1998]. Over the narrow valleys of the Russian part of the Baikal basin (Krasnyi Chikoy) the formation of a stable inversion is registered from November, and in some years, from October to March. The inversion intensity is largest in January, and the temperature difference at the station’s level and the 850 mb surface reaches 10−11 °C. With an enhancement in ruggedness of relief, there is an increase in the thickness and recurrence frequency of the number of days with surface inversion [Zhadambaa, 1972; Beresneva, 2006]. Thus, the average and the largest thicknesses of inversions over Ulaanbaatar and over the depressions in Western Mongolia can differ by a factor of 1.5 to 2. The highest recurrence frequency of inversions (about 50%) is observed when its thickness ranges from 500 to 1000 m in the former case, and from 1500 to 2500 m in the latter case. In the latter case the temperature difference on its upper and lower boundaries can reach 15−20 °C. Also, the deepest inversions with their high recurrence frequency and the lowest temperatures in the ground layer of atmospheric air are observed in stagnant locations. Due to the formation of inversions most stable in the cold year season over the area under study the free air exchange in the atmospheric boundary layer is disturbed. In such a situation, the quality of the atmospheric air in the ground layer will, to a significant extent, depend on local conditions, namely the recurrence frequency of calms and weak wind velocities, the precipitation amount, and on the amount of incoming impurities. The SCA was assessed following the technique reported by V.V. Kryuchkov  in which it is assumed that almost no self-purification of the atmosphere occurs in the event of the mean annual wind velocity and the recurrence frequency of calms characterizing stagnant phenomena, and with the smallest precipitation amount (table). The SCA manifests itself with an enhancement in wind velocity, a decrease in recurrence frequency of calms, and with an increase in precipitation amounts. In real situations, the indices show broader combinations. The use of the points-assessment approach makes it possible (by summing up the points of the indices) to take into account the diversity of the existing combinations of SCA: 3−4 points – extremely low, 5 – low, 6−7 – moderate, 8 – moderately high, and 9 – high [Bashalkhanova et al., 2012]. With reference to the mountain territories, allowance was made for the known regularities inherent in changes of climatic indices depending on the location of orographic systems relative to the main transport of air masses. We assumed that with the slope steepness varying from 6 to 20° and the altitude of the location in the range 1500−2000 m, average conditions are created for the atmosphere’s self-purification. With an increase in slope steepness >20° and with altitudes >2000 m, the probability of a good SCA increases. What has been outlined above was used in analyzing material reported in thus making it possible to identify in the study area four SCA levels. A moderately high SCA is characteristic for open steep-slope summit planes. A moderate SCA is intrinsic in elevated locations, slope surfaces, and in the shores of Lake Baikal and Lake Khovsgol. On the shores of Lake Baikal, however, Large temperature differences between land and lake contribute to a simultaneous development and superposition of the local forms of circulations, the maximal activity of which occurs in the zone below the height of the surrounding mountain ridges [Lake Baikal Atlas…,1993]. Therefore, here, despite sufficient wind activity (moderate SCA), the removal of pollutants beyond the depressions will be made difficult. A low SCA corresponds to gently rolling interfluves, river valleys, and to the lower parts of slopes. An extremely low SCA is set up in closed intermontane depressions and in the river valleys of the southwestern part of the basin nearby the anticyclone core, and along its periphery – in the areas of river valleys perpendicular to the base flow of air masses. It should be noted that by taking into consideration the mesoclimatic differences, it is possible to obtain a more differentiated assessment of SCA. It is known that the deviations of the mesoclimatic characteristics from the background ones are most clearly expressed in the wind velocity, temperature and precipitation regimes. Wind velocity change coefficients in various terrain conditions may vary from 0.6 to 2.0 in comparison with the wind velocity at open even spaces [Romanova, 1977; Linevich, Sorokina, 1992], their minimal values are characteristic of the lower parts of slopes, while maximum values are characteristic of the upper parts of windward slopes and peaks. The mesoclimatic differences in moisture conditions are also closely connected with the position of the slopes toward the main air-mass transport, their steepness and character of the geological substate. An increase in the rainfall with the altitude increase and its significant differences on windward and downwind slopes are known. Furthermore, the seasonal differences in SCA across the study territory will be substantial because of the characteristic features of the atmospheric circulation. Therefore, when planning the siting of production facilities in a particular territory, it is necessary to assess the mesoclimatic potential of SCA. Lake Baikal Atlas. (1993). Moscow, 160 p.
Bashalkhanova, L.B., Veselova, V.N. and Korytny, L.M. (2012). Resource Dimension of Social Conditions for the Life of the Population of East Siberia, Novosibirsk: Geo, 221 p.
Beresneva, I.A. (2006).The Climates of the Arid Zone of Asia, Moscow: Nauka, 286 p.
Sevastyanov, V.V., (1998). 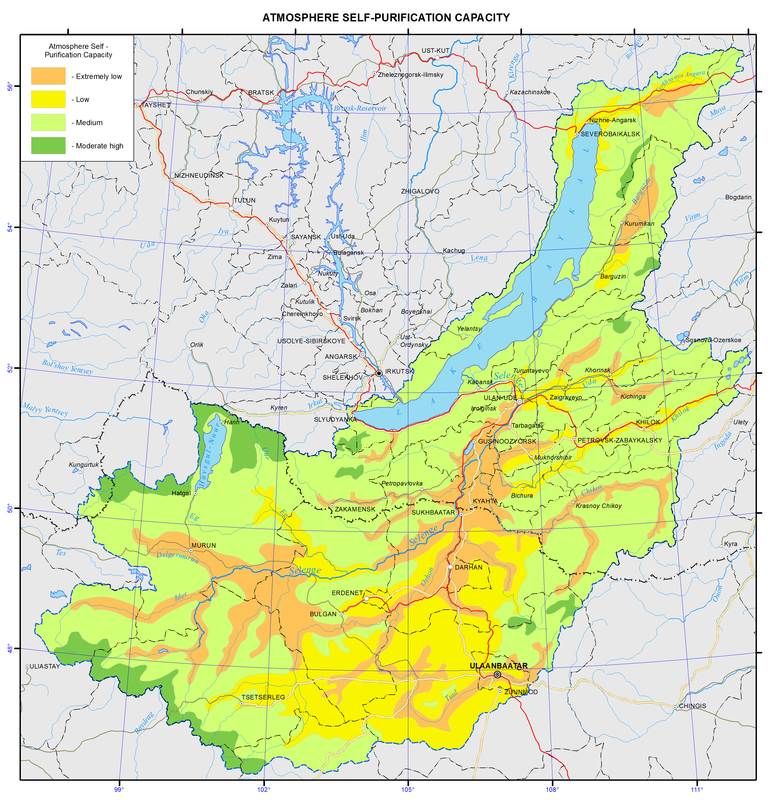 The Climate of the High Mountain Areas of Altai and Sayans, Tomsk: Izd-vo TGU, 202 p.
Romanova, E.N. The microclimatic variability of the main climatic elements, Leningrad: Gidrometeoizdat, 1977, 279 p.
Kryuchkov, V.V. (1979). The North, Nature and Man, Moscow: Nauka, 127 p.
Linevich, N.L., Sorokina, L.P. (1992). The climatic potential of self-purification of the atmosphere: an experience of multi-scale assessment // Geografiya i prirodnye resursy, # 4, pp. 160-165.